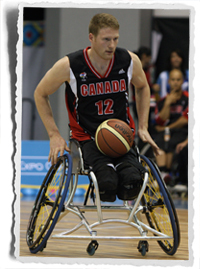 (Ottawa, Ontario) – Wheelchair Basketball Canada would like to congratulate Men’s National Team star Patrick Anderson of Fergus, Ontario who has been named Ontario Male Athlete with a Disability of the Year. The Award was presented last night at the 2012 Ontario Sport Awards in Toronto. Anderson, 33, played a key role for Canada at the London 2012 Paralympics leading the team to it’s third gold medal in the last four Games. He finished tops in tournament scoring averaging 25 point per game and first in total rebounds with 88 solidifying his reputation as arguably the greatest wheelchair basketball player of all-time. The other finalists for Ontario Male Athlete with a Disability of the Year the award were Jason Dunkerley (Athletics) and Garett Hickling (Wheelchair Rugby). “Congratulations to all of the talented athletes recognized at this year’s Ontario Sport Awards. We are proud to celebrate the motivation, determination and passion of Ontario’s finest amateur athletes and the dedicated coaches, volunteers and sponsors who support them. Our government is committed to achieving excellence in athletics across the province through programs that support our aspiring athletes from the playground to the podium, ” said Michael Chan, Minister of Tourism, Culture and Sport and Minister Responsible for the Pan/Parapan American Games. The Ontario Sport Awards were established 1965 to honour the top amateur athletes in the province. It is the highest recognition for sport excellence in Ontario. Winners are selected by the Sport Awards Selection Committee which is made up of former athletes and sport administrators from across the province. Wheelchair basketball is a fast-paced, hard-hitting, competitive sport that has emerged as one of the most competitive and athletic sports played at the Paralympic Games. Canada’s senior national teams are held in high esteem around the world for the elite skill and control that placed them on the podium with a combined six gold and one silver medal in the last six Paralympic Games.